France, viewed from the NASA Shuttle Topography Radar Mission. 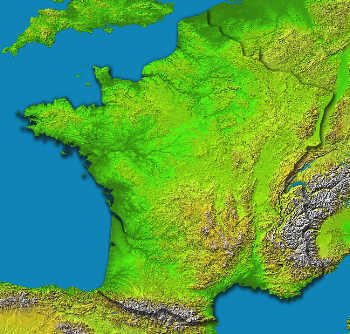 This image of France was generated with data from the Shuttle Radar Topography Mission (SRTM). For this broad view the resolution of the data was reduced, resampled to a Mercator projection and the French border outlined. The variety of landforms comprising the country is readily apparent. The upper central part of this scene is dominated by the Paris Basin, which consists of a layered sequence of sedimentary rocks. Fertile soils over much of the area make good agricultural land. The River Seine flows through. The Normandie coast to the upper left is characterized by high, chalk cliffs, while the Brittany coast (the peninsula to the left) is highly indented where deep valleys were drowned by the sea, and the Biscay coast to the southwest is marked by flat, sandy beaches. To the south, the Pyreneesform a natural border between France and Spain, and the south-central part of the country is dominated by the ancient Massif Central. Subject to volcanism that has only subsided in the last 10,000 years, these central mountains are separated from the Alps by the north-south trending Rhone River Basin. Two visualization methods were combined to produce the image: shading and color coding of topographic height. The shade image was derived by computing topographic slope in the northwest-southeast direction, so that northwest slopes appear bright and southeast slopes appear dark. Color coding is directly related to topographic height, with green at the lower elevations, rising through yellow and tan, to white at the highest elevations. Elevation data used in this image were acquired by the Shuttle Radar Topography Mission aboard the Space Shuttle Endeavour, launched on Feb. 11, 2000. SRTM used the same radar instrument that comprised the Spaceborne Imaging Radar-C/X-band Synthetic Aperture Radar (SIR-C/X-SAR) that flew twice on the Space Shuttle Endeavour in 1994. SRTM was designed to collect 3-D measurements of the Earth’s surface. To collect the 3-D data, engineers added a 60-meter (approximately 200-foot) mast, installed additional C-band and X-band antennas, and improved tracking and navigation devices. Location: 42 to 51.5 ° North, 5.5 West to 8 ° East. Orientation: North toward the top, Mercator projection. Image Data: shaded and colored SRTM elevation model. Original Data Resolution: 1 arcsecond (~30 meters).